Extension on Duke of YorkScharnhorst camo missions, please. There are two hours left before the missions that grant you the Duke of York and icy Scharnhorst camo cease. That's enough time for me to do the three missions that will grant me the camo. I can't log on, however, as the game client is telling me that the service is currently unavailable. 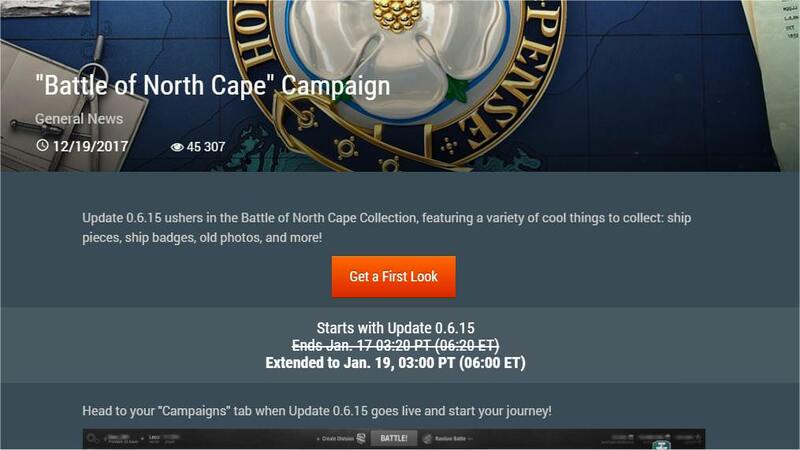 The number of players listed on the WoWS home page has also dropped from many hundreds to just over 200 in less than a minute. Can we please have an extension on completing these missions? It's supposed to run until the 19th. The missions for the camo stated that they were active for 2 more hours just before the game stopped working. I'm unsure which is correct. I hope you're right. Fingers crossed! The in game timer could only be update via a patch. Thankfully, this patch that we are getting today, is 2 days before the end date that they extended it to. When you log on after the maintenance you'll find you have 2 days left. Wargaming has seen your request and have reviewed it. After much deliberation, they determined you are a nice guy and are hereby extending the end time of these campaigns by two full days. Ask and ye shall receive. You must have connections! Yeah, but YOU are the only one they are extending it for - since you asked nicely. Everyone else can pound salt. Sheeit, i thought the extension was already applied and ground my [edited]off yesterday to get it. zapped my enthusiasm for the again rip. LOL...dang, we got down voted for these?!? I suppose no light-hearted pokes for fun are appreciated around these parts!